Since is huge interested in this smartphone, the chinese webshop GearBest have decided to make another cool sale for Vernee Thor smartphone from 26 April to 4 May. All tech sites are full of praise for this device. Due to the cost and what provides new Vernee Thor will undoubtedly be a new major sales hit. It falls into the category of “under $ 100”, at least in this special period , otherwise the regular price of 20 dollars higher. Every day at 9:00 UTC begins crazy sale at GearBest page. If you regularly visit our portal, then you probably know the hardware features practically, so we will simply remind the most important characteristics. The screen is 5 inch IPS with LTPS technology and high-definition resolution of 1280 x 720 (294 ppi), and it is further covered with curved 2.5D Corning Gorilla Glass 3 protection glass. The display contrast is excellent, even 1000: 1, the intensity of the illuminated 500 nits, while the 95% coverage of the NTSC color palette. You will like it and it covers 80% of the front surface. The external appearance is very nice and we would say slightly rounded on all sides and the frame is made of titanium, thin is only 7.9 millimeters and weighs only 140 grams. 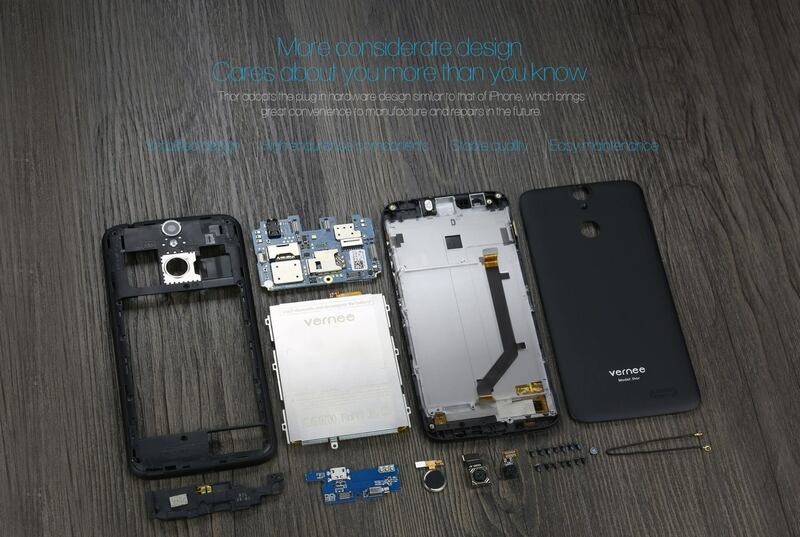 Vernee Thor runs on 64-bit and 8-core MediaTek MT6753 processor at 1.3 GHz, with Mali-T720 MP3 graphics. It has built-in 3 GB of RAM and 16 GB of internal memory expandable via microSD card slot up to 128 GB. The new Vernee Thor is on special offer at GearBest shop at a price of $ 99.99. Please note that quantities are limited, so be quick.